This is the MAY program (our first month!) The quantities are limited, so sign up for yours fast so you can make sure to get it. This is an EXCLUSIVE layout that you will not be able to get anywhere else! Make two feminine double page layouts with the hottest products on the market. The first layout "Totally Girl" features the new My Mind's Eye 29th Street "Fancy" papers, journaling tags, and Title in the trendy pink and green colors. Glistening rhinestones add the finishing touch to the scalloped Bazzill paper and soft velvet flowers. 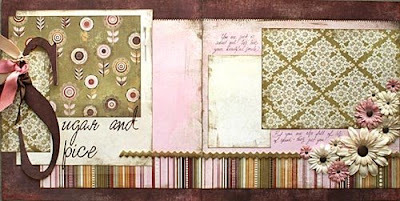 The second layout "Sugar and Spice" is perfect for the sweet - but sassy girl in your life. These pages are designed with the newly released "Sugared" line by Basic Grey. This beautiful layout is embellished with an array of 16 flowers, ribbons, brads, a pearl pin, and a giant Rusty Pickle chipboard letter. I am sure that this is going to seem like a really stupid question, but, here we go. I got on your website and I couldn't find where to sign up for your kits. My friend and I are wanting to sign up. Please let me know.